Werewolves may strike when the moon is full, but when it comes to lion attacks, it’s the days immediately following that pose the most danger to humans. Researchers studying lion attacks in Tanzania—where free roaming lions have claimed more than 600 human lives over the past two decades—have found that lions are four times more likely to attack during the 10 days following a full moon. But for another wild predator, the eagle owl (Bubo bubo), the full moon is the perfect time to let loose. 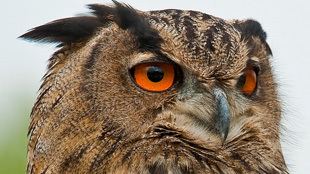 By radiotagging eagle owls in Spain and following them over the course of a year, researchers found that on nights with a full moon, the owls spent more time performing sexual and territorial displays. Their hunting sessions also lasted longer, perhaps because the prey is more likely to remain in hiding, making them harder to spot, the authors suggest in a recent issue of Animal Behaviour. Though the African crested rat, Lophiomys imhausi, may not have won the evolutionary lottery for the ability to produce toxins, it has found a way to be poisonous nonetheless, causing dogs to become violently ill or even dying after a single bite. The source of the poison, which had been a long-standing mystery in science, was identified when researchers observed captive African crested rats chewing on the bark of the African arrow poison tree and spitting the poison-laden saliva all over their fur. The poison in question, known as ouabain, disrupts ion pumps in heart tissue and has long been used to make poison arrow tips by African hunters, ScienceNOW reports. Meanwhile, on the other side of the world, woodrats living in the deserts of southwestern United States have devised strategies to avoid being poisoned by the plants they eat. The Stephen’s woodrat (Neotoma stephensi), for example, feeds solely on juniper and avoids poisoning through specialized enzymes that help it process large amounts of the juniper’s defensive toxins. Less clear, however, is how generalist feeders, such as the white-throated woodrat (Neotoma albigula), which feed on the toxic sagebrush and yucca in addition to juniper, deal with the intake of toxins. But according to a study published this week in Functional Ecology, the white-throated woodrat’s strategy is three-pronged: eat smaller meals, eat them less frequently, and drink lots and lots of water. European beewolf paralysing a bee. Female digger wasps (Philanthus triangulum, commonly known as European beewolves) take great care in preparing the food their young eat, and with good reason. 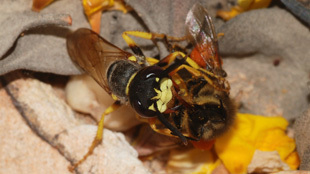 The paralyzed honeybees that a beewolf feeds her offspring often get infected with fungal strains that can kill the wasp larvae. In order to prevent this, beewolf mothers coat the honeybees with an oily secretion from their postpharyngeal glands that deters fungal growth and slows the desiccation of the bees. Throughout their lifetimes, beewolf females can embalm up to 100 honeybees—each bee receiving a coat of secretion that’s up to 8 percent of the beewolf’s weight. Not surprisingly, this protective embalming comes at a cost to the mothers and their future offspring, according to research published this month in Animal Behavior. Over time, females are able to produce less embalming fluid per bee, putting future generations of wasps at a greater risk for fungal infections. Although it’s been known that captive parrotlets—a family of small parrot species from South America—teach their babies a unique set of sounds that will serve as their calling card for the rest of their lives, researchers hadn’t been able to observe this naming ritual in the wild. But in a new study published in The Proceedings of the Royal Society B, researchers switched the eggs in wild nests and found that young parrots ended up learning the contact call taught to them by their foster parents—suggesting the calls are not hard-wired but passed down from parent to offspring.